Firstly, we need to quickly address the barefoot element of the Flyknits. For the uninitiated, barefoot shoes look to replicate the feeling of running without shoes. The premise is that this encourages the foot to land more naturally, finding a natural gait which takes pressure off your ankles and knees. The craze is gathering momentum, especially when you include zero-drop running shoes, and its not without its merits. For years the running shoe manufactures have been churning out larger and bulkier running shoes. With each iteration comes the promise that they deliver more cushioning and protection for our joints, yet this technology has not slowed down the torrents of running related injuries which began in the 1970s with the jogging craze, and which continue to this day. The barefoot running revolution is about fixing this by going back to nature. Nike are calling their barefoot line ‘natural’, and these shoes have less emphasis placed on bulk and more emphasis on a lithe, light and slimline design. The Nike Flynit’s are the epitome of this movement, and with an RRP of £130, they are Nike’s flagship natural shoes. 1) The design: the pair I picked up are a striking green and black combination, and your certainly unlikely to lose your feet as you ramp up your run. The shoes are an interwoven mesh of toughened fibre, with punctured vents which keep your feet cool. The mesh design is thus reminiscent of a sprinters shoe as opposed to a distance running shoe. The design almost encourages you to run barefoot, although I would recommend otherwise as the toughened stitching would be likely to cause blisters over distance. 2) the lightweight nature of them: my gym work often includes a range of training, including high intensity interval training (HiiT), Fartlek, Tabata and other high intensity training methods. I typically interspace this intensity work with lower intensity training, which forms a giant session incorporating all types of work. I therefore need versatility without much weight, and my first impression of the Flyknits was very strong in this regard. 3) The cushioning: I prefer my running shoes to offer fairly subtle cushioning, and I feel that these deliver on that. Too much cushioning generally equates to bulk, but too little can leave me with pins and needless at night (presumably from the pounding that my feet take over a 90 minute session, 6x per week). Unlike the Nike Free 4.0s, which I found to have an overly exaggerated arch, the Flyknit racers strike a happier balance. This is personal taste, and it will depend on your running gait as well as your personal preferences as to whether you agree. 1) on the road, the cushioning let them down slightly: to place a caveat here, I do the vast majority of my training in the gym, and thus my running on a treadmill. This is out of personal taste, but I like to test running shoes on the open road as well. Whilst I found them excellent on the treadmill, I did feel slight discomfort running over worn Tarmac (the kind that’s starting to wear into rough gravel). The thinner soles had a knack of collecting some sharper, smaller stones and these would cause discomfort until they fell off. On one instance, I stopped to kick them off because of the irritants, which whilst not major, once noticed it would nag away at me. 2) as much as I love the meshed design, from both the aesthetics and the keeping your feet cool perspectives, I do worry about the longevity of these kinds of shoes. I have founded with past versions sporting a similiar design from rival manufactures, that they have worn quicker than regular shoes. The mesh can be prone to gathering holes, especially around where your little toe can press against the side repeatedly over time. 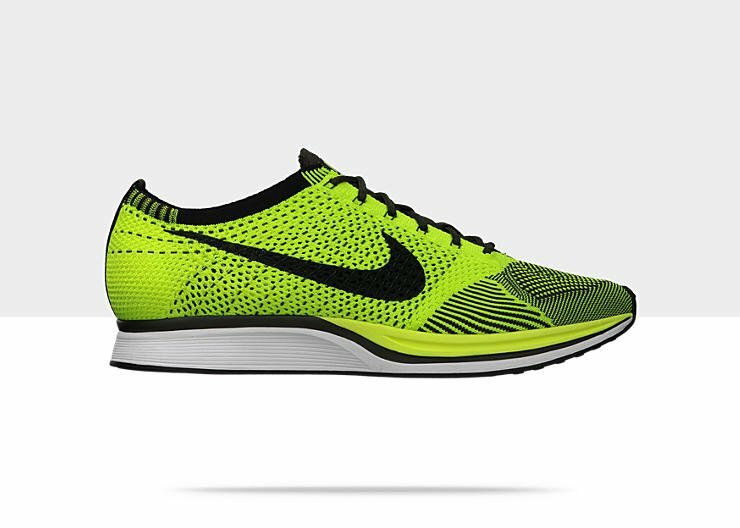 3) at £130 RRP, the price of the Nike Flkynit racers is quite high. This reflects the high end fit technology and the fact that they are targeting serious athletes and actual racers with these shoes. Despite this, you can’t help but feel that you’re not getting a huge amount of shoe for your money. Different folk will have different perspectives here, and I think it’s a vase of doing enough training to justify the outlay. Overall, my early impressions of these shoes are very positive. As a gym shoe, I think these could be truly excellent. They’re lightweight but high performance, and you don’t require a vast most of cushioning whilst running on a treadmill or training on other cardio equipment. For any kind of high intensity training they excel, and I definitely noticed stronger performance at fast speeds with them. As an outdoor training shoe, these can definitely still work well but have some slight drawbacks. The thinner, lighter design is more noticeable here and that’s something to bear in mind. Overall though I am very impressed with the Nike Flyknits and definitely recommend you consider the, when weighing up your next training shoe.